Unitech, one leading real estate developer with its sign up with Telenor (TEL.OL) a Norwegian telecoms group had stepped into the telecom services in 2008. On the other hand Telenor aims at setting out a new plan to carve a niche for them in the subcontinent. The Norwegian group also aims at secure a stand ahead to the scandal over the award of operating licenses. Telenor said that they, dis-united with real estate builders Unitech, would set up a new entity for obtaining operating licenses. Earlier the courts had cancelled the regional operating permits numbered 122, which were held by eight carriers comprising Telenor/ Unitech joint venture Uninor. This dissolve will benefit Telenor more as the company will be able to resume their business in India. Although it still has to rethink whether to spend billions to regain the lost licenses. The company revealed to the media that they are to appear in the forthcoming 2G spectrum auction under the new entity. They added that they were not yet to confirm on their participation at a later stage. The 2008 2G spectrum corruption scandal cost the exchequer as much as $36 billion in lost revenue. The 2008 2G spectrum corruption scandal was over the selling of mobile phone permits at a cheaper rate than the market value. This scam had led to the resignation of two ministers of India as they were found guilty on bringing such a loss of billions of revenue to the Nation. Telenor had blamed Unitech for the cancellation of their license. Uninor was the branded joint venture of real estate giant Unitech and the Norwegian Telenor. Initially Unitech was against the ending of the venture. The Indian company which first said of having veto rights to block any transfer or exchange of its assets has now given in to sell its share for a very nominal sum to the Norwegian group. As a consequence of losing the licenses Telenor had to write down so much of its Indian assets worth 8.1 billion crowns. Company officials disclosed that the company persons are in talks with several potential new partners in India. Company added that October 18 is made as the deadline on which the company will decide whether to participate or not in the upcoming state auction that will start in the month of November. The new licensing round seems very costly for the Norwegian company. Whatever might be the risk, Telenor assured of breach- free participation. Telenor has to find an Indian Partner as the law permits only a maximum of 74 percent foreign shareholding in telecom service. 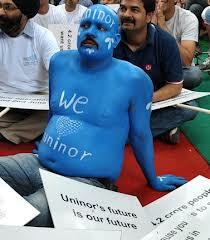 Unitech reacted on their dissolve with Uninor as all disputes and claims between the two parties stands withdrawn or concluded. The real estate giant is going back to the real estate field to gain greater fortune. This entry was posted in Real Estate News and tagged 2008 2G spectrum corruption scandal, 2G scam, 2G scandals, 2G spectrum corruption scandal, Online Real Estate, Real Estate, Telenor, Uninor, Unitech by designer. Bookmark the permalink.